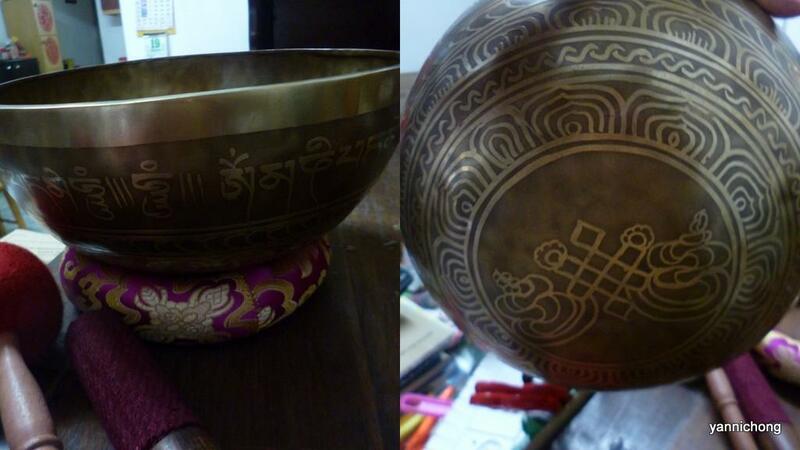 tibetan HAND HAMMERED 7 METALS SINGING BOWL , HAND ENGRAVED MANTRA INSIDE AND OUTSIDE . 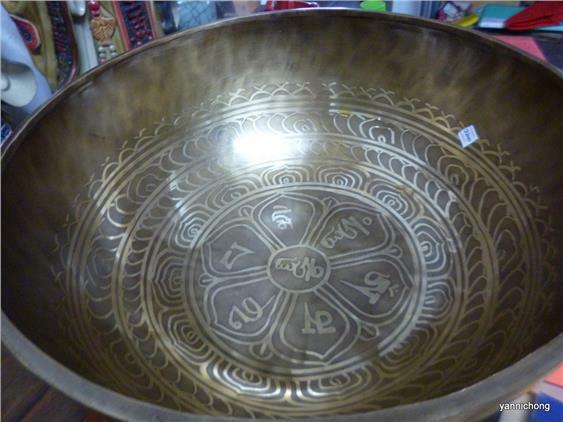 This singing bowl is made of seven metals, i.e. gold, silver, copper, iron, tin, lead, and zinc. All the metal used has a specific purpose and represent the sun and the moon and other planets. This bowl can be used for meditation, music, and chakra cleansing. 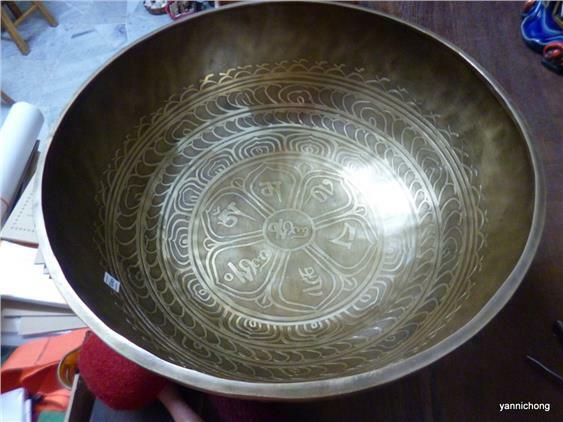 A striker and a big mallet is included with this singing bowl and this bowl was hand-hammered in Tibet. The bowl have long lasting tune which create totally peaceful environment around you,those who are looking for real handmade bowl from Himalaya will not be disappointing by this bowl. 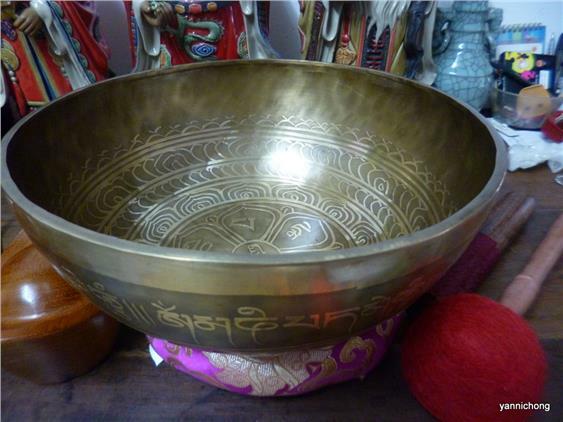 Deep resonating sound , long lasting .Sound from Tibetan Singing Bowls entrain the brain to move into the Theta brain wave frequencies that induce deep meditative and peaceful states, clarity of mind, and intuition. The sound vibrations impact our nervous system, engaging our relaxation reflex and inhibiting the stress or pain response. In the east, health is looked at much differently than in the west; illness is thought of as a manifestation of disharmony within the body, such as an imbalance in the cells or a given organ. Having said that, since matter is energy that vibrates at different rates, the structure of matter can be changed when you alter the rate of vibration. The body is said to be healthy only when each cell and organ resonates in harmony with the entire body. What these bowls do is cause the brain to switch to Theta brainwave frequencies that heighten one’s intuition, clarity of mind, as well as deep meditative and peaceful states. This positively affects our nervous system and engages our relaxation reflex while also inhibiting the pain or stress response. When this alignment occurs, health and healing all come into balance, creating deep harmony within and without. This can easily lead to spontaneous healing. As the great Tibetan master, Bodhisattva Gwalwa Karmapa puts it so finely, these Singing Bowls emit the “sound of the void” which is really the sound of the universe. Given that the science behind this method is slowly being uncovered, modern medicine is just starting to measure as well as validate its ability to heal our body, mind, and soul.